Why a Tower of Babel? Genesis 11 has the language spoken at Eden (thus “Edenic”) being diversified at Shinar or Sumer. The world’s relatively small human population was huddled together in fear of another Deluge. A powerful tyrant emerged, Nimrod, who had everyone build a huge ziggurat, step pyramid, so that people could climb up to safety were there another tsunami-like disaster. This tower was built near the much later site of ancient Babel (Babylon, present day Iraq), so it was called The Tower of Babel. More than defying the Creator by surviving a Flood, Emperor Nimrod wanted a centralized tower to focus the state’s authority. This is much like the Kremlin. No one 10,000 miles away in the U.S.S.R. could lift a hand without an order from the Kremlin authority back in Moscow. Therefore, the fitting reaction to an attempt to make the entire world population march in lockstep was to diversify the once universal language. No longer could a dictator dictate to all. Kim Jon Il’s dictatorship is limited to Korean speakers. The tower builders couldn’t understand each other. The tower, and one-world-government idea was abandoned. Archeologists have traced millions of “borrowed” bricks from many miles around to an immense ruin. The step-pyramid design not only then went to Egypt, but to Central America as well. How could this be? The same reason that there are elephants in Africa and in India – which are not close together. But they USED to be close together. When the Earth was one “Dryness,” a single continent, that herd of elephants may have been initially divided by a river. But the break-up of the Earth, begun by the Deluge, set off a Continent Drift (which is ongoing). So the elephants didn’t move – the Earth did. Humans often didn’t have to migrate thousands of miles – the earth did the splitting up for them. The “Bering Strait” theory is absurd and unnecessary. The submarine first revealed vast undersea traces of how the continents have moved. A child cutting up a world map could tell you where Africa and India once touched, why fauna and flora in Equatorial Africa is so much like the Amazon, or how little the step-pyramid builders in Egypt had to travel before finding themselves in what would become Central America. The geological breakup parallels the linguistic one. There was a Big Bang at Babel, when one tower builder suddenly spoke Proto-Germanic, but his fellow suddenly only understood Proto-Australian. Like Continental Drift, language breakup into dialects would be ongoing. Historical linguists therefore think it’s only natural that a single global language would become 6,000 languages. When in doubt, simply add zeros to the number of years it would take in today’s rates. See the magazines in the “Resources” at the end of this essay, to follow how this ancient Genesis thesis finally won scientific acceptance. Genesis begins with light and darkness separating, waters and dryness dividing, even the separation of a male-and-female human into two separate human sexes (Genesis 1:27). The Earth break-up in alluded to in Genesis 10:25. The break-up of languages, in Genesis 11, meant Edenic being spun off into the 70 proto-nations mentioned earlier (in context of genealogies) in Genesis 10. Before they were ur-nations, they were groups of people happy to find other, say Proto-Dravidian speakers (close to Sanskrit), and they emigrated together from Shinar to found what would later be called the Indus River civilization in present-day India. Sanskrit then devolved into eleven Dravidian languages. All this diversity was planned, whether or not The Tower of Babel sounds like a reaction to Nimrod. An Eternal knows the future, and plans accordingly. Edenic letters and words were made to diversify. Many letters, like Bet, Het, Kahf, Ayin, Pey, Tsadi, Shin and Tahf have two or more ways to be pronounced. It can be a challenge to trace them all, but the vast human vocabularies can be sufficiently traced back to the relatively small, and economical Proto-Hebrew vocabulary of Eden. See the “DIRECTION” chart below. Humans and animals were likewise given all the genes they needed to adapt and diversify. Only recently have biologists established that all races, all nations of Mankind, are from a single woman (mitochondrial “Eve.”) Noah’s ark could only fit one pair of proto-canines. But they had the genes to allow for the wolves, foxes, hounds, jackals, etc. and the 100s of breeds that humans would facilitate. Is the Tower of Babel scenario physically possible? Could people actually have their languages changed by some electro-magnetic disturbance or etc. that rewired the Control Panels of our brains? The brain’s ability to switch languages is far beyond current medical knowledge. 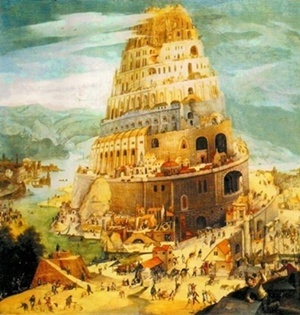 The dismissal of the Tower of Babel scenario as myth reflicts an incomplete awareness of neuro-linguistics..
We don’t yet know how glossolalia can happen (Speaking in tounges), but it is documented that humans can speak unlearned languages. Scientists Think Man Emerged From Africa - Should NOT The First Language Be African? Speech is not about hominids, but modern homo sapiens. Anthropologists agree that agriculture began in Israel and Jordan some ten thousand years ago. If you find a language without agricultural words, you are welcome to call it pre-Edenic. The oldest human set of remains ever found with the hyoid bone (in the throat) for speech was unearthed in the Carmel Caves near Haifa, Israel. The hyoid is the bone stuck in the throat of Edenics deniers. All the hard evidence points to Proto-Semitic being earliest. We are only a few decades past the time when it was taught that everything good came from dead white men from Greece and Rome. It is expected that some old school Eurocentrists will defend Atheism and Classicism from this book’s brash assault. Amid the fractious skullduggery of anthropologists digging up skulls in Africa and Asia, nobody has found an older skeleton with a hyoid bone anywhere outside of Semitic turf. The burden of proof is on scientists to prove that actual speakers, not just tool-using knuckle-walkers, might have begun civilization and literacy somewhere other than in the Middle East. Below is a list of the forms of Daled-Resh-Khaf from the “DIRECTION” entry in the E-Word CD Dictionary. You decide if there may be something to Edenics, or if this is a bunch of lucky coincidences and unknown borrowings. Chaos or Control. Any Bible concordance will confirm that ד-ר-ך Daled-Resh-Kahf has all the meanings below. Any bible concordance will confirm that Daled-Resh-Kahf ד ר ך has all the meanings below. Here is an example of what happened to Edenic DeReKH ד ר ך – Dalet-Resh-Khaf. You’ll see that only Dalet-Resh-Khaf (Biblical Hebrew DeReKH) has all the “genes” for the global diversity of its Tower-of-Babel spin-offs. 1) Dalet: D and T are “dentals” or the interchangeable tooth-made letters. 2) Resh: R and L are “liquids” or the interchangeable tongue-made letters. 3) Khaf: G, H, K, Q are “gutturals” or the interchangeable throat-made letters. Scrambled, metathesis forms of DeReKH, like Turkish DoGRu (straight), and Irish/Gaelic RuTHaG (path) were left out in favor of only those in perfect dental-liquid-guttural sequence. Other imperfect but notable entries include Italian DiReZione (route, trend), German RiCHTung (route, trend, way... source of RIGHT) and “directory” words like Albanian Drejtori, Italian DiReezione, and Manx oRDaGH . The list above is remarkable for the many forms of DeReKH that kept the dental-liquid-guttural sequence of the original Edenic. Scrambled forms of ד ר ך DeReKH (way, manner,) include Faroese and Icelandic HaTuR. But in a more discursive dictionary style, not charts, words are treated for their sources and cognates. DaRaSa - in swahili means a classroom: when i think of it, it can also mean DiReCtion - where someone gets inStRuCTions of life, which can be related to RoaD to life. Likewise DaRaKa: which means authority, and can be related to The one who DiReCts people in a path of life. Good job Isaac , keep it up. With regards to the AFRIKAANS word "DiReK"... it means to be 'straight forward" or a translation: directly. It does NOT mean "road / path". Remember Afrikaans, Flemish, Duthch & German are VERY closely related & many people speaking these languages can easily understand each other when speaking these languages even though they themselves may not be able to fluently speak each others languages. In regards to the one asking casual general questions for edenic of mind/brain/intelligence/intellect/will: What is presented so far is enough to stimulate mind/brain/intelligence/intellect/and the will to chose the right road/path to follow in your quest for truth. I will not be surprised if the author could answer your question if he desired to gratify you with an answer. What is the edenic for mind / brain / intelligence / intellect / will? what about "drag" as a "direction" word, and that stone one hangs over a ship to provide some drag is called a «drogue` stone.